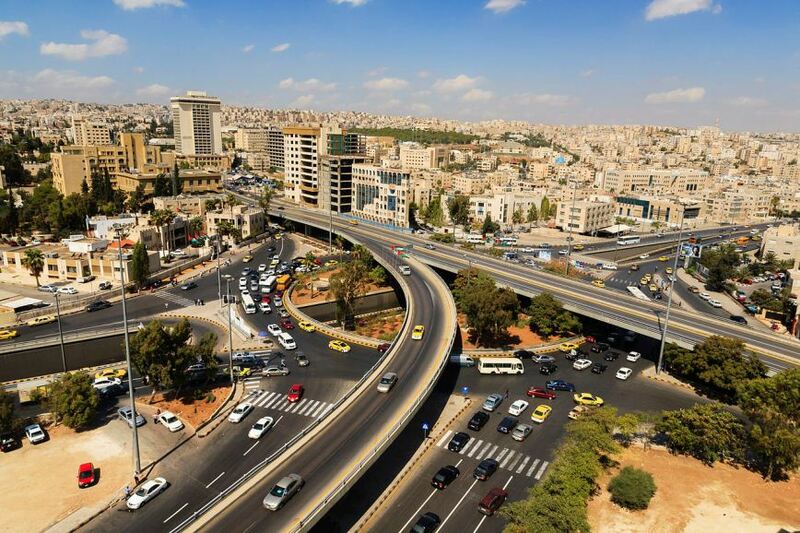 View of Amman. Photo: Tariq Ibrahim AbdulHadi. Leakage, water loss and water theft form a huge problem in Jordan. An estimated 40% to 80% of the water supply is lost in the network, depending on the location. Inefficient administrative processes, outdated infrastructure and inadequate maintenance are the main culprits of this huge waste. Administrative issues include unbilled water use, illegal extractions from the system and metering issues (e.g. reading errors/inaccuracies, equipment failures, connections not metered). In some areas, lack of maintenance or poor quality of repair materials, limited penalties for illegal water use (no or ineffective law enforcement, no or very small fines) and a lack of public awareness and/or personal responsibility for water wastage also play a role. However, the country’s geography also forms a challenge to water supply. Jordan’s key water resources (main rivers and aquifers) are generally situated at a considerable distance from the cities and agricultural areas, meaning that water needs to be transported between the source and the consumer, sometimes covering a great difference in altitude. Almost 80% of the population lives in cities in the northern part of the country, at elevations significantly higher than the main surface water sources. As a result, the Jordanian government has had to invest in an extensive and expensive water network, which needs to be constantly maintained and upgraded. The energy requirement and cost of transporting the water is also substantial. Experts predict that climate change will result in summer temperatures in the Mediterranean region rising between 2.2 and 2.5°C, accompanied by a 4% to 27% decrease in annual precipitation, which will increase the risk of droughts. Increased evaporation and reduction in soil moisture will reduce surface and groundwater recharge. This will in turn lead to increased need for crop irrigation. Climate change is also expected to increase the number of extreme weather events such as rain and snowstorms, which can result in flooding. It will also cause greater variability in annual temperature extremes. Jordan’s water supply will be significantly affected by these factors. Additional effects include increased risks of soil erosion, flooding, siltation of rivers, dams and reservoirs; increased salinity and year-on-year variability of water supplies; and reduced flows of major rivers such as the Jordan River (perhaps up to 80%). All of these risks will have economic, health, and water and food security impacts. Jordan has limited internal financial capacity to implement major projects. Hard choices need to be made and critical projects with low cost/benefit ratios should be targeted. Increasing tariffs and taxes could help finance the maintenance of existing water infrastructure and the development of new projects. However, this is politically sensitive and substantial rate increases would probably not be feasible. Jordan is largely dependent on external funding sources (e.g. foreign private enterprise, NGOs, foreign aid, foreign governments). However, foreign funders’ priorities are not necessarily in line with the government’s goals. Grover, V. et al., 2010. Integrated Water Resources Management in Jordan. Christensen, J.H. et al., 2007. ‘Regional Climate Projections’. In: Climate Change 2007: The Physical Science Basis, Contribution of Working Group I to the Fourth Assessment Report of the Intergovernmental Panel on Climate Change. Cambridge: Cambridge University Press. Tolba, M. and Saab, N., 2009. Impact of Climate Change on Arab Countries – IPCC. Arab Forum For Environment And Development.